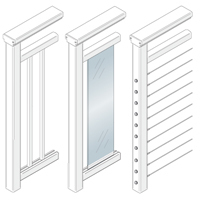 Top rails come in 6 styles and are sold in 10 and 20 foot lengths that can be trimmed to size in the field. Series 150 top rails are used exclusively on stairs to provide a graspable top rail. Series 150 and Series 100 top rails are attached to the faces of the posts using Rail Connecting Blocks (RCBs). 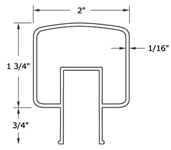 Series 200, 300, 350 & 400 top rails rest on the tops of the posts and are secured with stainless steel screws. 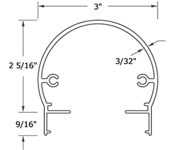 Applied Grab Rails (see Additional Items) with extensions are available as an accessory item to meet ADA and code stair grab rail requirements. Small 2" wide square shaped top rail. The narrow width allows it to be installed between posts (using RCBs) instead of on top of posts, creating a a newel-post-styel railing with posts rising above the top rail. Requires an Applied Grab Rail when used on stairs. 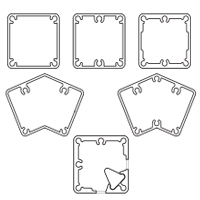 2" wide top rail for with easy-to-grasp design. 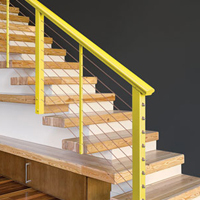 Can be used for both stair and horizontal railings. Meets residential code requirements for stair Grab Rail sizing; requires an Applied Grab Rail when used on stairs in commercial settings. 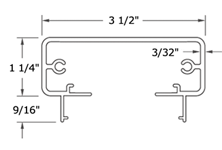 3-1/2" wide, rectangular top rail. The flat surface is a convenient perch for your favorite beverage as you enjoy the view. top rails rest on the tops of the posts and are secured with stainless steel screws. Requires an Applied Grab Rail when used on stairs. 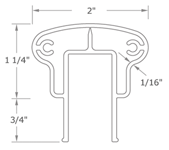 1-1/2" radius top rail. The smooth rounded shape offers a more contemporary accent to those less traditional architectural designs. 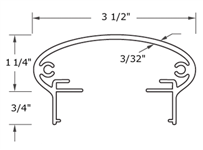 3-1/2" elliptical top rail. 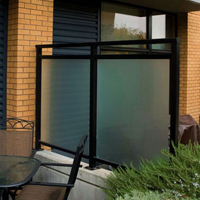 The sleek, stylish design offers another option for those who prefer a less angular top rail appearance. 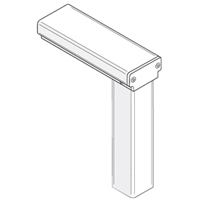 Low profile cap for adding your own wood or composite top rails (must be used with top rail to achieve necessary frame strength: wood and composite top rails not included).